Schlage "C" keyway is standard. Other keyways are available upon request. Also available in Small Format/Large Format Interchangeable Core. 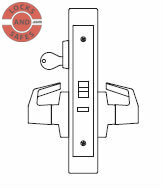 PDQ MR Series Mortise Lock - Grade 1 - J Wide Escutcheon Trim. Consider purchasing the inexpensive, yet high quality and reliable PDQ MR148 Mortise Locks in-place of the Best 45HR Mortise Lock. The PDQ MR148 Mortise Lock with J Wide Escutcheon Trim has been designed with an attractive look and has been engineered for high performance and security. It meets all customer expectations. One of the performance highlight of this lock is that it complies with the Unified Facilities Group Specification 08 71 00 (August 2008). The lock comes in a Schlage C Compatible keyway but can also be made available in keyways of other manufacturers. Its Interchangeable Core is compatible with Best, Arrow & Falcon. The cylinder is a 6 or 7 pin Brass Mortise Cylinder. This and many other qualities makes the PDQ MR148 Mortise Locks an attractive and inexpensive alternative to Best 45HR Mortise Locks. UL/CUL 10C listed for 3 hrs, for single doors up to 4'0" x 8'0"